﻿ Vuedoo - View all you do. 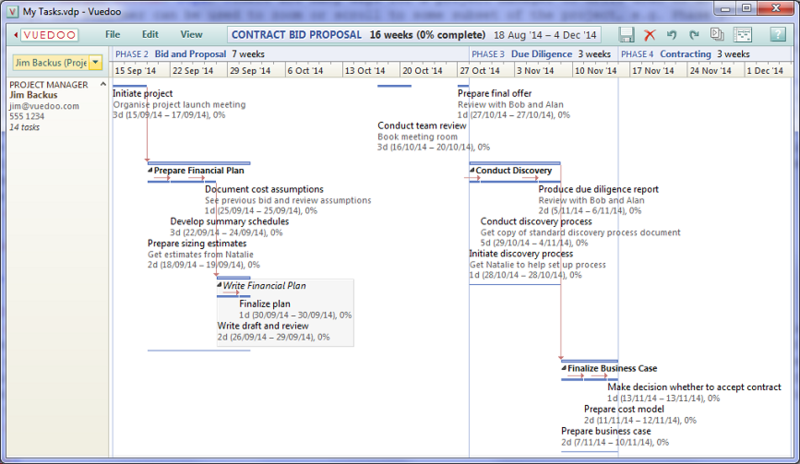 Do you hate Gantt Charts? Then you're going to love Vuedoo! Vuedoo is the world’s first project scheduling software to feature the incredible Tufte Chart, a data-rich visualization of startling clarity. Finally, a project chart that everyone can understand. Vuedoo is an innovative scheduling tool for planning, managing and tracking projects. However, it is not just for project managers. 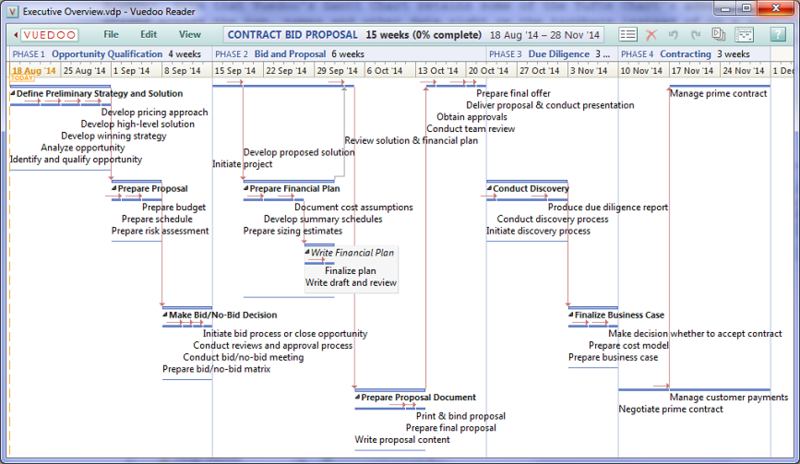 It is also an extremely clear and readable communication tool, with the flexibility to reach all project stakeholders. Vuedoo provides customisable options to "slice and dice" project data to suit the intended audience — from high-level executive overviews down to the finest detail for individual team members. At the same time, the information it conveys is richer and more concise than any other project graphic. 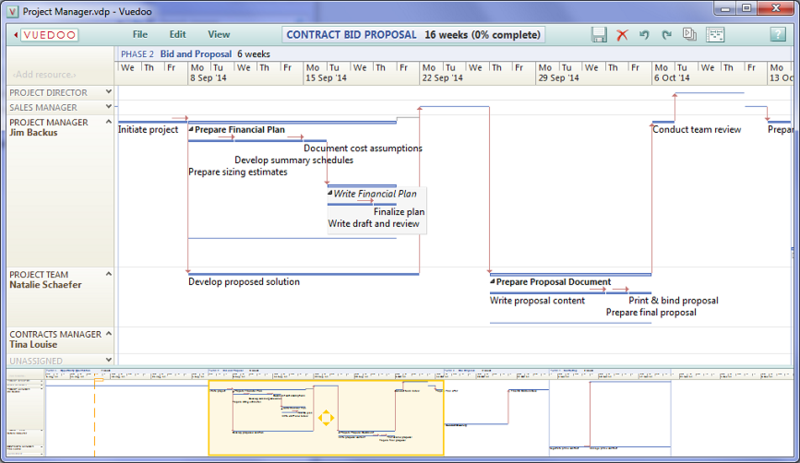 Here the Scroomer pane has been hidden to allow enough room for an overview of the whole project to be displayed in one page. Notice also that even though the summary tasks are all closed up, the links between the subtasks of different summaries are still displayed. In industry standard project management software, such links are hidden, losing valuable information when perusing an overview — not only are many dependencies unseen, but the critical path will be incomplete or completely invisible. All the options for controlling how the data is displayed are available from the View Ribbon. Some options are also available from the quick access toolbar. From here, you can choose the project view and how the data in it is arranged. "Choose Text" allows you to select the info you want to display in the chart. Clipping the text as needed allows the task bars to be laid out in the most compact way possible; showing full text allows you to see all of the info but the tasks will take up more space on the chart. Changing the font size also proportionally changes the taskbar thickness. And the Scroomer can be moved or hidden. The following describes specific scenarios for various roles and contexts. If required, the assigned resources can be displayed on the taskbars — select View/Choose Text. And the assigned resource can be changed in the Task Properties dialog (double-click on a task). There are many ways for a project manager to drill down to do detailed planning, scheduling and assignments. Firstly, the Scroomer can be used to zoom or scroll to some subset of the project, e.g. Phase 2. Secondly, some or all of the summary tasks can be expanded to reveal their subtasks to as many levels as desired. Thirdly, resource rows can also be expanded or collapsed to allow the manager to focus on a subset of resources, or to hide any resources that have no tasks in that part of the project. Another way to drill down into more detail is to use the Reveal All option (on the View ribbon), which expands all the tasks in a different way: it moves the summary tasks out of the way to reveal just the detail tasks down to the lowest level. This allows the manager to see more of the subtasks and to perform detailed assignment and load balancing with less distraction. The summary tasks can be shown at the top of the chart to provide additional context, or hidden to provide more screen space. Notice that when a summary task is selected at the top, it's subtasks are highlighted below on their resource rows. Note also that in this example the Scroomer is hidden, but you can still zoom by dragging the timeline, and pan in both directions at once by dragging the chart background directly. 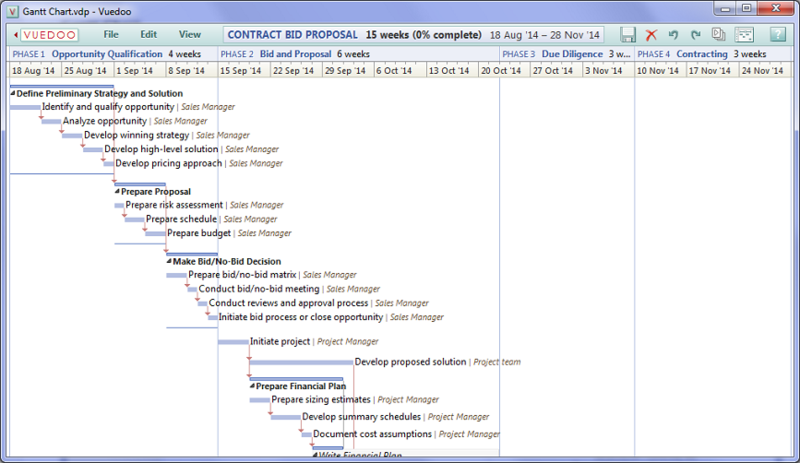 The My Tasks option (on the View ribbon) provides a highly detailed view of all the tasks assigned to one resource. This is primarily aimed at allowing team members to clearly see what they need to do, without having to search for their name scattered all over a Gantt Chart or Timeline Chart. However, it can also be used by project managers when doing focused work on one resource at a time. The displayed resource can be selected from the drop-down menu in the top left corner of this chart, or from the right-click menu on any resource in the full Tufte Chart. Notice the short notes that can be attached to any task (the Description field in the Properties Dialog). 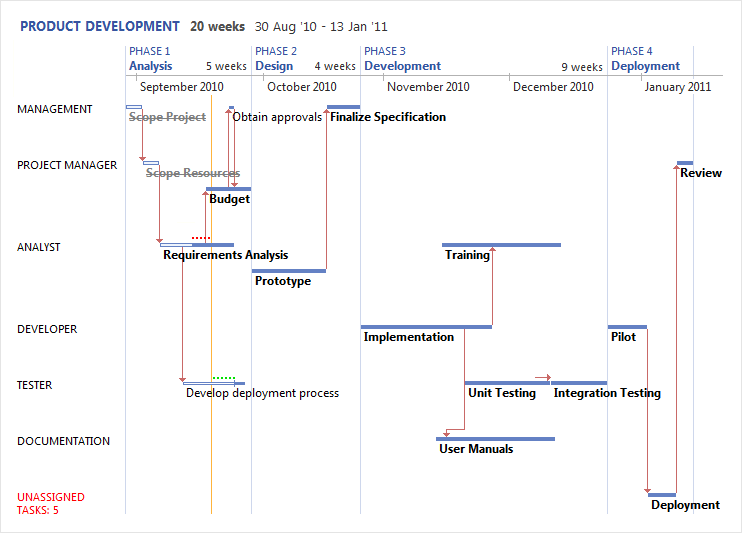 For completeness, a Gantt Chart is also provided for those who prefer a more familiar format. 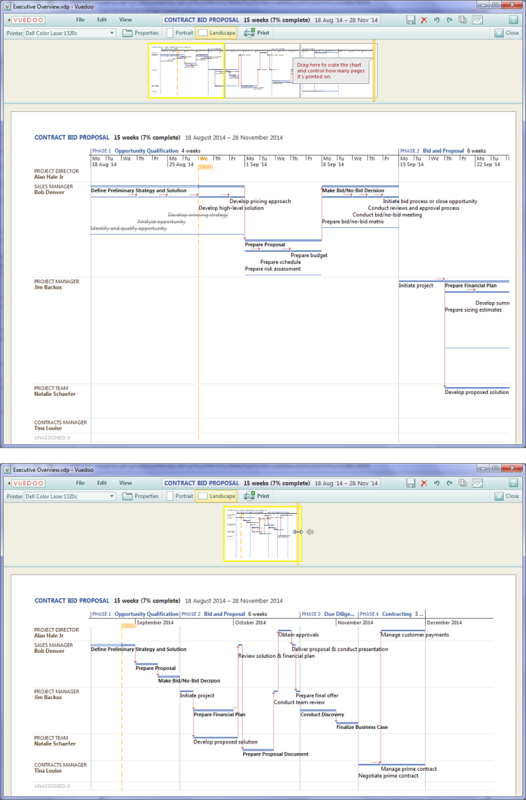 Note that Vuedoo's Gantt Chart retains some of the Tufte Chart's advantages over the traditional format. For example, phases across the top, names and other data right on the taskbars instead of in a separate spreadsheet, highlighting of early/late status, showing links between subtasks of closed summary bars and highly intuitive direct manipulation of all chart objects. For those project stakeholders who just need to see and review a schedule but not modify it, our free Vuedoo Reader allows them to do this without having to purchase additional software licenses. This is not only a big saving for an organisation, but produces a much better result than the usual approach. Having all the view options to play with is much more useful than a static .jpg or picture in a document et cetera. And best of all, the Reader downloads and installs in seconds, without requiring admin permission. When giving a presentation using a projector, it is often useful to use larger fonts for audience readability. The text size controls on the View menu allow you you to temporarily enlarge all text in the chart. Notice that the taskbars are automatically resized to match the text size. The text could also be enlarged for other reasons, e.g. if the person reading it is short-sighted. Alternatively, the text can also be made smaller to fit more tasks into the screen area. To print out a project, select Print from the File ribbon. This will take you to the Print View, shown below. Similar to the other views, at the top is a scaled-down overview of all the pages to be printed, and below that is an actual size single page selected from the overview. There is also a Print Toolbar, from which you can select the printer, open the Printer Properties pages and select the page orientation. You can also modify any of the view options on the View menu, and even make minor edits to the chart. Finally, you can set the time scaling factor for the chart by dragging the Scaler (the orange vertical bar on the right edge of the overview), which determines how many pages the chart is printed over and also automatically calculates the time increments that will fit on the timescale (e.g. days, weeks, months, years). When you are happy with the setup, click the Print button on the toolbar to send the chart to the printer. Like what you see? Try Vuedoo for free. Vuedoo's unique Instant Install™ is the fastest and easiest on the planet. Copyright © 2011-2015 Jarryl Wirth. All rights reserved. | ™Scroomer and Instant Install are trade marks of Jarryl Wirth. ® Vuedoo is a registered trademark of Jarryl Wirth in the United States and other countries.